I love the updated Dumbo attraction at Walt Disney World’s Magic Kingdom! The twin spires of Dumbo are a joy to behold, especially at night. And yes, I unabashedly ride Dumbo all by myself, and I am a middle-aged lady. 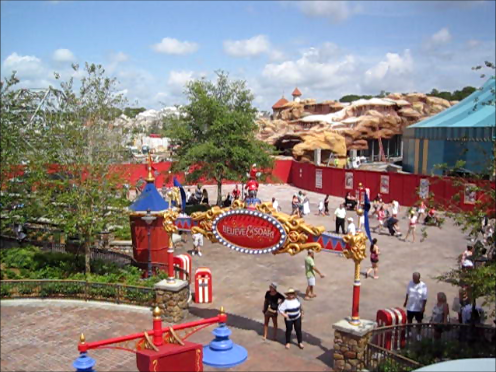 Right now one of the bonuses of riding Dumbo is the view of the Fantasyland construction. If you’re not already familiar with the Fantasyland expansion plans, AllEars has a great overview and recent updates. Tortuga Restaurant at Walt Disney World? MouseExtra points us to a Screamscape post about a possible Tortuga-themed restaurant at Walt Disney World’s Magic Kingdom. And I, for one, would be booking my ADRs ASAP. If they do it right, it would be great. As MouseExtra suggests, this could be like Cinderella’s Royal Table, but for those of us who prefer swordplay and explosives to glass slippers. It wouldn’t be enough to go half-way. Think of the Blue Bayou at Disneyland (pictured at left), my absolute favorite Disney restaurant worldwide. Rough up the decor a bit around the edges. Maybe a few audio-animatronic pirates on the balconies? Borrow their menu, too — Disney’s corporate stragegy is all about leveraging synergies right? Re-purposing existing properties? Mmm, I’m hungry for that creme brulee already. From the late 80’s on Imagineers indeed affixed ‘story’ after ‘story’ after ‘story’ to their rides, shows and attractions. Unfortunately, however, the concept of originality eluded most of them. While certainly WDI saw some unbridled successes under Eisner’s ‘What’s the story?’ ordinance, it seems Imagineers had little more than one ‘story’ up their sleeve. And they shamelessly told it again and again and again. It goes something like this: a character or prop has gone missing and the guests and/or other characters are tasked with finding it/them. At times I think they’ve overreached their point. Can you really boil down the Pirates of the Caribbean ride story to this? Pirate Jack Sparrow, treasure in hand, has gone missing among the villagers on the Isla Tesoro and Captain Barbossa is out to find him. And that’s not even counting last summer at Disneyland, what with the crazy trouble with snakes and spiders when I was touring with Indiana Jones, or that wacky ride down Mullholland Drive. I don’t even want to talk about what happened when I got into the car with that Toad. Is the message here that Imagineers are falling down on the job with creating stories for rides? Or is it that some stories are so flexible, you can make a zillion successful rides based on them? According to The DIS, tickets for the Pirates and Princesses Party at Walt Disney World’s Magic Kingdom go on sale May 1, a month earlier than had previously been reported. Tickets also go on sale that day for Mickey’s Not So Scary Halloween Party, and Mickey’s Very Merry Christmas Party. MouseExtra this morning reports that TouringPlans.com has posted July 9, 2007 as the start date for rehabilitation of Spaceship Earth (details of the rehab available on AllEars.net). The end date is still unclear. In the short term, this is sad news . 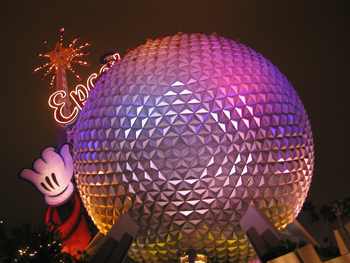 . . it means that many summer visitors to Walt Disney World will not be able to ride either Haunted Mansion or Spaceship Earth. As both of these are high-capacity attractions, it may also have implications for wait times on other attractions. However, both of these attractions are badly in need of work, so I’ll gladly take the inconvenience and disappointment now, in exchange for better ride experiences next time around. Just heard this on this week’s Inside the Magic podcast . . . Disneyland Paris has a web site where you can download various Disney Parks audio for free. They have four MP3s currently online, and apparently post new files every couple weeks. Today’s selection includes the full Walt Disney World Magic Kingdom Monorail spiel. (Say, am I the only WDW Today listener who giggles every time I hear Narcoosee’s mentioned?) I’m rooting for them to post the Animagique MP3 next! It’s a little confusing at first . . . the files download as zip files (a problem for some people’s firewalls, I realize), and you need a password to unzip them (the password is listed on the web site). But it seems that once you’ve unzipped and unlocked the files, you can import them into your local music library.